Julesworks Ensemble rides again with the 57th Episode of Santa Fe’s longest running, not quite monthly, live variety show presenting Theatre, Music, Comedy, Stand Up, Spoken Words, Dance, and much more. We apologize the previous date for this show had to be rescheduled. Spearheaded by and starring Julesworksers Loyalists, Danette Sills, Rose Provan, Ellchemi Ossorio, Jules, and Yvette Michelle Martinez, with our youth outreach sensation, GabeCat, Christl McKenzie, and Lexie, as well as their young family members who have grown up watching and now participating in Julesworks Follies the show, this episode will feature as a new addition in a sort of framing device three interstitial Roundtable Discussions with the ensemble discussing timely topical issues such as ending art, giving up, cats, April fools, life, the universe, and more. Falling after some major(ish) holidays, JW will present some hopefully somewhat appropriately-timed and themed skits, including reprising past characters of Jules’ Cheech and Ellchemi’s YoMomma, who will wind up being sent to couple’s therapy. Also confirmed is the return of our musical guest, Terry Diers, a multi talented performer who has played all around the world. Terry has played past Julesworks shows and we welcome his gracious return as he will share his unique, fun, and varied musical styles. Other hopeful artists who intend to join, schedules permitting, include musician, Timbo Arnoldo, and the return of the great musical puppeteer, Devon Ludlow, depending upon life, health, work, etc. In addition to reprising past characters, bits, and concepts, we will reprise, refined and rebirthed of course, some of our recurring beloved bits including Ask the Revisionist Historian in which the audience can ask questions of our experts, including our masked young geniuses. We hope to have a mix every show of return loyalists, newbies, and people who perform occasionally as their lives permit. Other Loyalists who perform when possible include Greg Turner, Chris Diestler (who may be missing his first show thanks to filling in the real world work shows of the great retiring Ira Gordon), Andy Kirkpatrick, Stephen Rommel, and more. 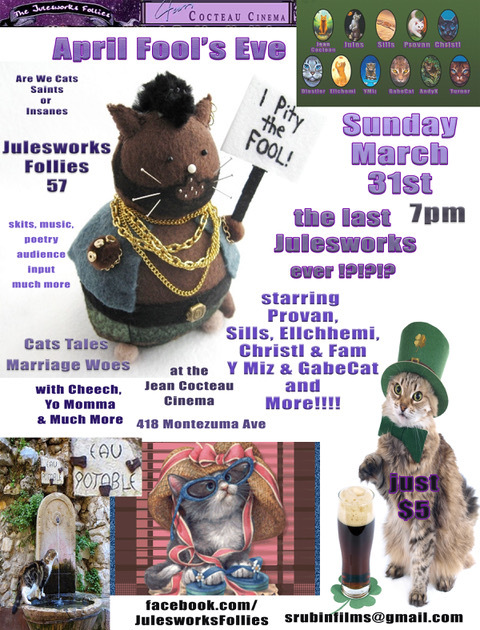 For this show, the Julesworksers will present a medley of scripted original material mixed with some rehearsed improv riffing off of their created characters and ideas including Cheech and YoMomma going to couples therapy in separate visits, to the likes of Danette Sills taking on Dr Ruth, Christl as an heiress of Freud and Nietschze, and a snippet from Rose Provan’s original Provonova Method, which can be seen at other shows, as well as new original material from Rose. We strive, aim, and hope in each show to meld returning talent and reprising and refining the scope of material mixed with new performers’ genres and styles, and we aim to have music in the mix. Also, we expect and hope for returns and newcomers for our Open Slot Slot in which other audience members can jump up at the end of the show to share a short performance piece. We always attempt to stage other bits to involve the audience. And, the Julesworksers will carry on the tradition that the show will end with an Ensemble Musical Finale by the troupe with audience participation encouraged. As usual, there will be literary poetical musical moments including Julesworksers Literary Outburst by Jules as well as Christl & Lexie. All performers and artists, as well as anyone interested in helping behind the scenes, are encouraged to submit possible show ideas to Jules at: srubinfilms@gmail.com. Julesworks will continue to stage their show roughly every six to eight weeks, so stay tuned for the announcement of the next date and theme and possible alternate venue.